TM ranks among the successful manufacturers of components for road and train vehicles. As an authentic partner, the company offers customized, cutting-edge and economic solutions. Experience, reliability, quality and success of many years constitute the basis of the current programme of products. The customer’s structure is complex and global. 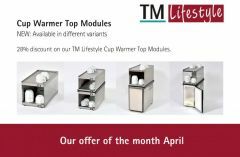 28% discount on our TM Lifestyle Cup Warmer Top Modules. Visit our new homepage for our TM Lifestyle range! TM Lifestyle - The new brand of TM, where thoughtful design meets lifestyle! For several decades we - TM Technischer Gerätebau GmbH - have specialized in the manufacture and assembly of individual customer solutions. Our strengths are cooling solutions and other lifestyle products for medium and small series. Above all, with our brand TM Lifestyle we serve the coffee market with products and can count renowned manufacturers among our regular customer base. In addition to milk coolers, cup warmers, add-on modules and cooling combinations, TM Lifestyle´s product portfolio also includes elegant design furniture with a cooling function. 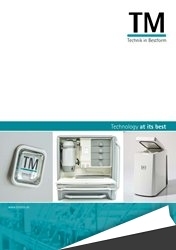 Have a look at our new image brochure.